If you’re going to be in a fairy tale with somebody, make sure you’re both telling the same story. Daisy Flattery is an incorrigible free spirit with a soft spot for strays and a weakness for a good story and a bit of adventure. Why else would she agree to the outrageous deal offered by her button-down, workaholic neighbor Linc Blaise? The history professor is desperately in need of a fiancée to capture a dream job at a local college—and Daisy is up for the challenge. But something funny happens on their way to the altar that breaks all the rules and changes the game. Falling in love was never part of the bargain. Their little charade has taken in everyone—including themselves. Now with the proverbial midnight hour approaching will the fairytale finally be over or will opposites not just attract but live happily ever after? “That’s not a father. That’s a sperm donor. Forget him. He’s a mess. Concentrate on me. I’m terrific." On writing: This was the third book I wrote after Sizzle and Manhunting. I loved it, but it had elements that kept it out of the Temptation line, so my agent took it to Bantam where Beth de Guzman said "No problem," and I rewrote it using everything I'd learned in the five years since I'd first finished it. It moves in a different direction from most of my work, and I'm grateful to Beth for giving me the chance to experiment and improve a book I cared about so much. On the animals: Jupiter is a composite of two of my dogs, Mosey and Bernie. Mosey was born with one eye and other problems, and Bernie falls over a lot. But they were both the happiest dogs I've ever known (Bernie still is). The cats in this book were taken straight from real life, my own black cat, Liz, and my calico cat, Annie. And yes, Liz truly is 95% potted plant, and Annie really does have a voice that can peel paint. 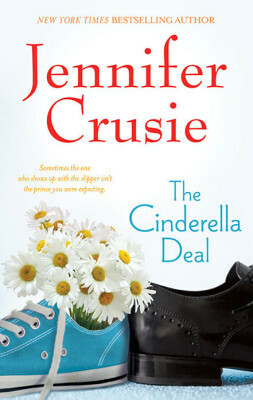 Dear Readers, I wrote The Cinderella Deal a long, long time ago, but it’s still one of my favorites because it was so hard to write and I learned so much writing it. I’d written six romantic comedies before this one and in all the commentary on them, there was one recurring theme: my stories were a little . . . cold. More comedy than romance; no heart, no soul. That was a fair assessment; if there was one thing I’d learned in my creative writing classes it was to avoid melodrama, to never be sentimental, to go for irony and detachment whenever possible because otherwise I’d get killed in the critiques. But I think I knew all along I was wimping out, that if I’d had any backbone, I’d have gone first for the hearts and not the brains of my readers, so I decided that for my first book for Bantam, I’d try something new, something different. Hearts would be touched, tears would be shed. By God, I was going to be emotional. Then I sat down to write it and I’m here to tell you, writing comedy may be hard, but writing honest emotion is ten times worse. Every time I got near an over-the-top moment, I had to fight my knee-jerk tendency to step back into irony or even worse, to make a joke. After awhile it got easier, and I can truthfully say that there are moments in this book that are downright weepers--well, I cried--but the important thing I learned is that tragedy is like comedy. You can’t add it to a book, you have to find both the humor and the pain within the story and then write both as truthfully as you can, even if it means that critics will accuse you of being sentimental or melodramatic. Good stories are about both hearts and minds, but the heart always comes first. Here’s hoping you like the heart at the center of The Cinderella Deal.